A family heirloom handed down from John Ott to his granddaughter Diane Whealy. 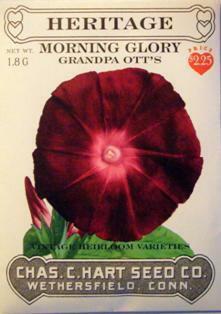 One of the original varieties that inspired the beginning of Heritage Farm. Grown at many historical living museums. A heat loving hardy annual vine that grows to 15 feet when supported. Rich velvety looking deep purple flowers have a bright rose star and throat which open each morning. A real eye catcher in the garden! Soak seeds in water for 24 hours before planting. Plant directly outside after last spring frost. Grandpa OttÕs is more tolerant of cooler temperatures than other morning glories and often will self-seed from one year to the next.